The Vegan Magpie: Oumph! at Tesco offer! Hello! 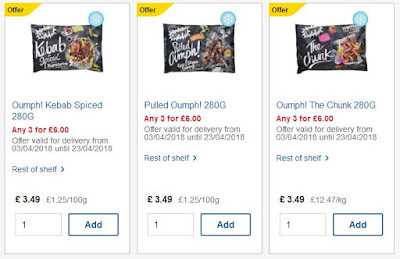 The extremely popular fake meat brand Oumph! has recently launched at Tesco with their 'chunk', 'kebab' and 'pulled' varieties. From the 3rd April to the 23rd April you can get 3 bags for £6. They're usually £3.49 so this feels like a great saving and an especially good time to try out all the types! Just head here to see them online: Oumph! Tesco or pop to your local store. It has been launched in 400 stores so hopefully one will be near you! I've tried Oumph! in the past at a festival and thought it was delicious! So with this offer, I recommend giving them a go if this product is your sort of food. Vegan Town weekend postage offer!